At the moment I am not really feeling breakfast; the mornings are really cold and dark and I am up so early I can never be bothered with much. 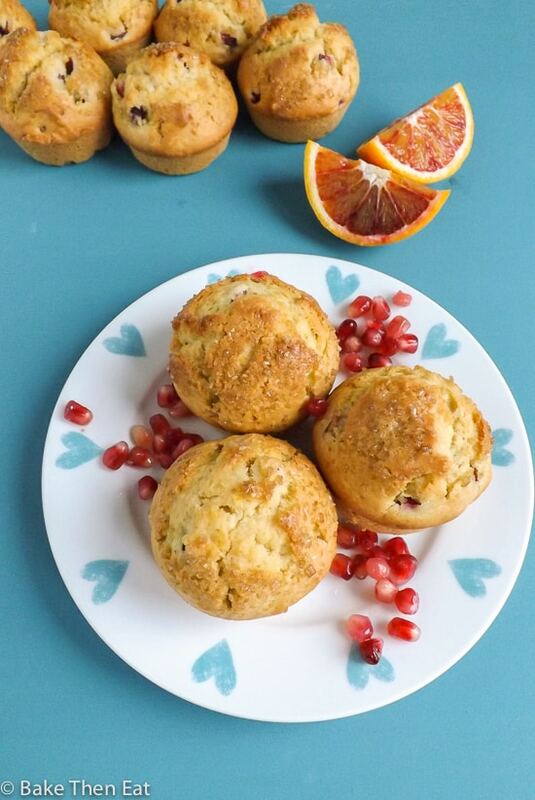 So I have been on a bit of a breakfast making frenzy to try and spark my appetite back into life and these Blood Orange Pomegranate Muffins have certainly done the trick. 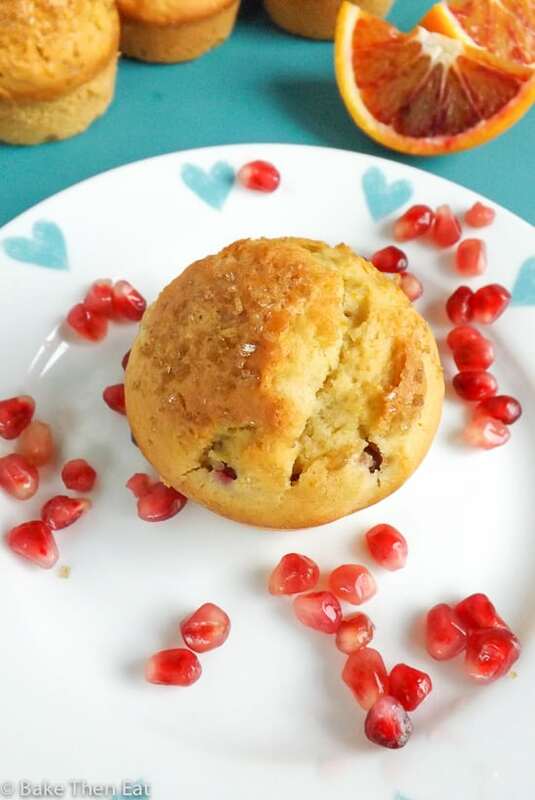 Fresh and zesty packed with little pomegranate seeds throughout bursting in every bite, these muffins make a great quick breakfast treat. I have used blood oranges for this recipe purely because they are in season and they have an amazingly fresh sweet taste. But these muffins will work perfectly well with regular oranges if blood oranges are hard to come by. We use the zest of a whole large orange and the juice as well, making sure the orange flavour doesn’t get lost in this muffin. To make sure they are nice and fruity I have also added in pomegranate seeds, so each bite has that lovely juicy fresh flavour to it. 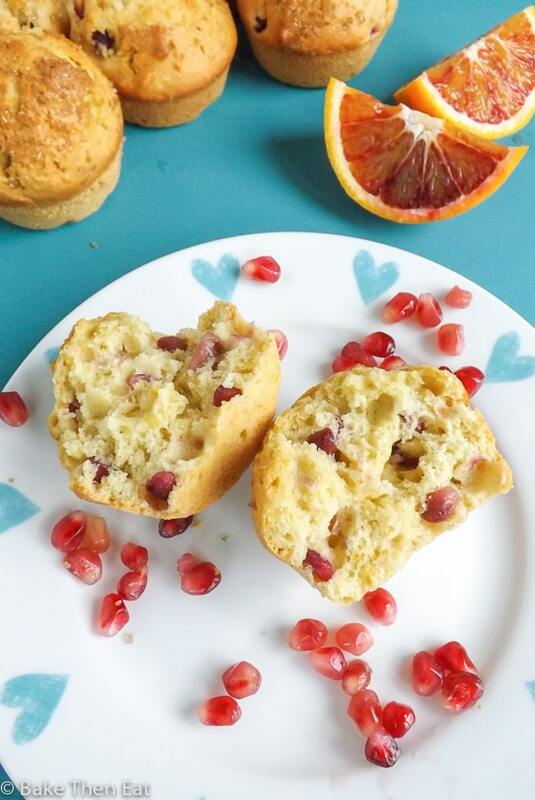 And because pomegranate seeds pop as you bite into them they really add another dimension to these muffins. 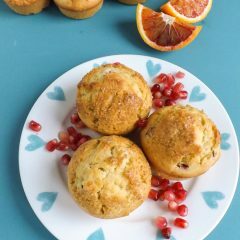 So if you like a sweet fruity breakfast that is easy to whip up then these blood orange pomegranate muffins are for you. There is nothing like a fruity muffin to get your breakfast appetite back in a hurry. The only problem being these were so tasty I couldn’t leave them alone and by the evening I had already had 4 of them! It took a lot of will power to walk away from the cake tin for the night. 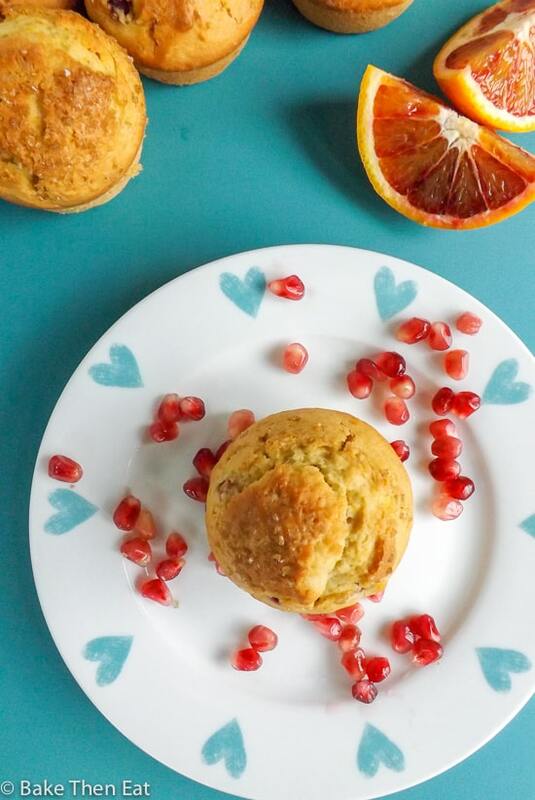 Blood Orange Pomegranate Muffins are fresh zesty muffins packed full of orange flavour and studded throughout with pomegranate seeds. Great for breakfast or a quick pick-me-up. Preheat your oven to 220C / 425F / Gas mark 7 and lightly grease a 12 hole muffin pan or use liners. In a medium sized bowl add in the flour, baking powder and salt and give them a little whisk together then place to one side. In another medium sized mixing bowl add in the eggs, sugar, milk, oil, vanilla extract, orange zest and juice and give everything a really good whisking together. Pour in the flour mix and very gently mix the flour into the liquid ingredients. Please be gentle so your muffins remain light and fluffy. Over mixing the batter at this point will give you tough hard muffins. Scoop the batter into your muffin pan filling each hole about 2/3rds full. You should have enough batter to fill the 12 holes. If using sprinkle the tops of your muffins with a little coarse sugar. Pop the pan into your hot oven. After 5 minutes reduce the heat in your oven to 190C / 375F / Gas mark 5 and bake for a further 13 minutes. The initial burst of heat will give them the high domes and the lower heat will bake them through without burning. Check your muffins after the remaining 13 minutes to see if they are baked through, insert a skewer and if it comes out clean then they are baked through. If not give them another minute and check again. Carefully remove the hot muffins from the pan to a wire rack to fully cool down then enjoy. Kept in an airtight tin these muffins will last for 5 days but like a lot of baked goods they are best consumed on the day of baking. These muffins will also freeze for 2 months. These muffins look perfect for breakfast, Emma! I love blood oranges and with pomegranates, these sound amazing!!! These muffins look absolutely delicious! I would love to make them with pomegranate seeds someday! Where can you find blood oranges? Hi Ruth, thank you. Blood oranges also known as Ruby oranges should be available in the fruit section of most grocery stores for the next month or two. The season is pretty short so grab them while they are in season! A great combination of flavours; so seasonal. Getting back into baking again after a long time! 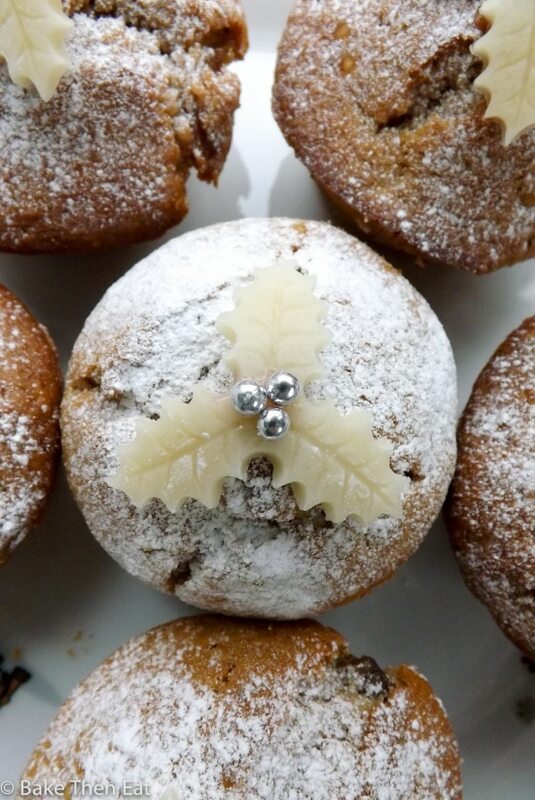 These are lovely and muffins are so quick and simple to make. Hope to try more of your recipes soon. Thank you. I love the double dose of fruit—for a most lovely, refreshing breakfast treat! Hi Liz, thank you. Can’t beat a fruity breakfast! I am imagining how great these muffins must smell! Swooning at the thought! Ooo I’ve never put pomegranate seeds in muffins before! I love that idea! These sound fantastic! Hi Ashley, thank you I really loved the pomegranate seeds so tasty! These muffins are great for any time of the day!